As the temperature starts to drop, it’s more pleasant to spend time outdoors. And while you’re enjoying the change of seasons, there are a few ways you can also help your lawn make the transition.Autumn’s cooler temperatures and spotty rainfall are actually great conditions for your lawn to absorb energy, moisture and nutrients before it settles into winter hibernation. These easy fall lawn care tips will also ensure a healthier, more beautiful yard next spring. 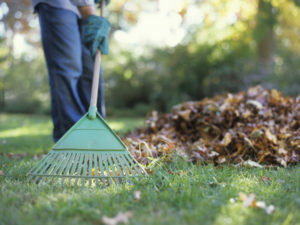 Fall lawn care means raking your leaves! Make sure you rake them or mulch them to keep your grass healthy. Rake any leaves. Sure the reds, oranges and yellows look nice on the lawn, but they block light and trap moisture to the grass underneath. Rake the leaves right away so your lawn doesn’t suffocate. Don’t put away the mower quite yet. Your lawn will still need regular cuts until the first hard frost of the year. Set your blades between 2 ½ to 3 inches high to start. As it gets closer to wintertime, you can drop the blades down, but avoid cutting off more than one-third of the grass’ height. Keep watering. Just because it’s getting colder does not mean your lawn needs less water. There might be more rain and less evaporation, but that may not be enough to keep the grass’ roots well hydrated. Ideally, your lawn should get at least an inch of water per week. Set your sprinklers or irrigation systems accordingly. 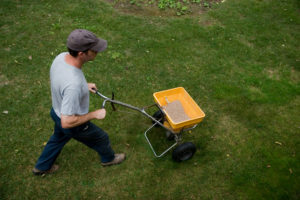 It’s important to fertilize your lawn in the fall to provide the nutrients needed to get through the winter months. Make sure your grass is breathing. If you have a cool-season grass, this is the best time to check for signs that your lawn needs aeration. This one-day task gives the soil easier access to oxygen, water and fertilizer. Give roots a snack. Grass leaves grow much more slowly in cool temperatures, but the roots are also growing. Fertilizing now encourages the roots to grow deeper and to store the nutrients they will need for a good start next spring. Fill in bare spots. Fall is the best time to repair any bare spots on your lawn. Be sure to identify the cause of these spots before fixing them. Otherwise, the problem could return next year when your lawn wakes up. Fall lawn care doesn’t involve a lot of work, gives you a good excuse to spend time outdoors and your efforts will pay off when a beautiful lawn emerges in the spring. I recently moved to Florida and these tips are sure to help me keep my lawn healthy. It will surely keep me and the family outdoors! Thanks for the tips! When do you think I should stop watering? I don’t think it would be good to stop too early, but I also don’t want to overdue it either. It would be nice to know when to stop. Then I won’t ruin the grass! It really depends on what state you reside in. A good rule of thumb in the Northern tier of the country (Colder mkts) is to stop watering once your grass goes into dormancy for the winter. In the Southern tier of the country (Warmer mkts) you could water all year long.